An up to date business intelligence report compiled at the headquarters of Transparency Market Research (TMR) has notified that the shares in global interactive projectors market are fragmented and the competition is intense. The analyst of the report has detected that the major players of the interactive projectors market are focused on harnessing new technologies and making an impression their consumers to stay ahead of the curve. The report has identified BenQ Corp., Seiko Epson Corp., Dell Technologies Inc., Touchjet Inc., Optoma Technology Inc., Panasonic Corp., Sony Corp., Hitachi Ltd., NEC Display Solutions Ltd., and Boxlight Mimio as a few players who held moderately prominent positions in the global interactive projectors market as of 2017. 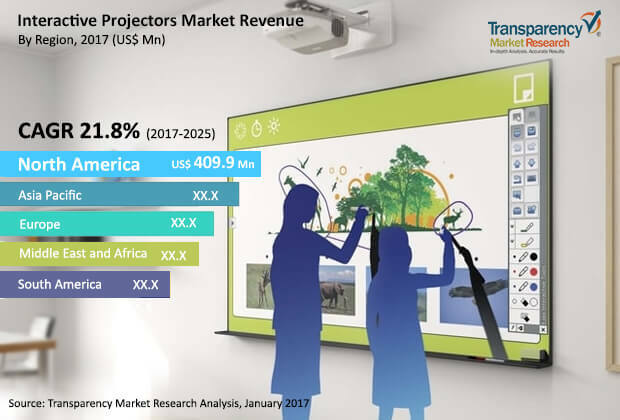 If the projections of the TMR report are to be believed, the global interactive projectors market will attain a value of US$5.97 billion by the end of 2025, with the demand multiplying at a steep CAGR of 21.80% during the forecast period of 2017 to 2025. Application-wise, the education sector is currently providing for the most substantial chunk of demand in comparison to corporate and government. In terms of product type, the interactive projectors market has been bifurcated into standard throw, short throw, and ultra short throw. The latter has been identified to remain most profitable. Geographically, North America is the most lucrative region owing to high adoption rate of new technologies. That being said, the Asia Pacific interactive projectors market is forecasted to expand at an above-average CAGR of 24.30% during 2017 to 2025, which is a reflection of growing number of small and medium enterprises and government funding for the educational sector. As the technology is harnessed further, the overall cost of the products is also expected to fall down and be more affordable for a larger base of consumers. In the near future, the demand for DLP projectors is foreseen to expand quickly as they offer benefits such as high contrast ratio, images are immune to dust due to sealed optics, and are lot more cost efficient than 3LCD projectors. On the other hand, low awareness levels among a vast majority of potential consumers in a number of emerging economies and the advent of interactive flat panel displays are a few restraints holding back the progress of the interactive projectors market. Nevertheless, the growing demand for ultra short throw segment is anticipated to open new opportunities in the interactive projectors market. While North America is currently the most profitable region for the vendors operating in this fragmented market, Asia Pacific is projected for a much stronger growth rate.